One of the best RV resorts we have stayed at to date. The complete grounds were very clean and well kept. The whole staff is very friendly and accommodating. We will stay there agin. Beautifully maintained first class resort Wide paved roads and sites Awesome Internet Great location for peninsulas and sleeping bear dunes Perfection! Beautiful RV resort. Lovely sites and very well maintained. Owners take great pride in this resort. Excellent utilities and hook ups. Nice walking trail and enclosed dog run. Convenient to downtown and walking/bike trail across the street. TAKE NOTE - This facility is deeded lots only, of which, all lots have been purchased. The Home Owner's Association (HOA) does allow rentals by the lot owners with restrictions. The restrictions include Class A, Class B and 5th Wheel that are 28 ft. or bigger and less than 10 years old. This is a beautiful facility but is NOT a campground. This place is a diamond in the rough! Extremely clean, peaceful, friendly and a great location. The staff and locals were so friendly! Pool was sparkling and well kept with a great pool area to relax if you weren't swimming. The poolside changing/restroom was a welcomed touch. We enjoyed the ice cream freezer to pick from. Appreciated the exercise/weight room with everything anyone would want for a good workout. After a good workout we would ride our bikes around to take in the beautiful grounds and RV's. The best part was the spacious individual shower rooms, as big as home and spotless. Another bonus was the short drive to the beaches of Lake Michigan. We will most definitely be back. A perfect 10. 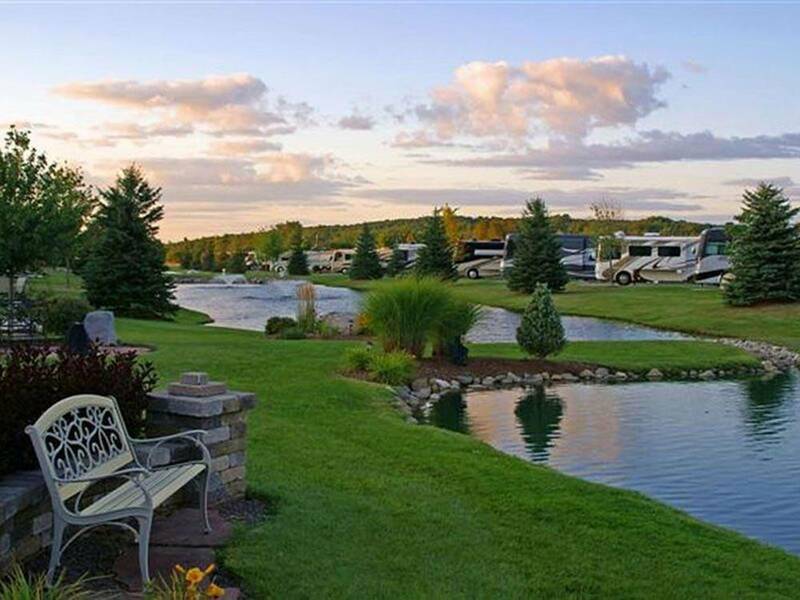 Park Model RV Summer Home in the Traverse City area. The Cottage Estates Park Model sites will be located on the north end of the resort and each site will have a pond view or valley view. Create Your Up North Cottage Estate! From N Jct of US 31N & Hwy 72, E 1.5 mi on Hwy 72 (L). Note: RVs restricted to Class "A" & "C" Motorhomes & Fifth Wheels 10 years or approval and minimum 28'.